"Good Enough" certainly isn't "Good" when we're talking about "tufted" area rugs. These handmade-rug look-alike's (unfortunately confused with REAL handmade rugs) are cheaply made and thus cheaper than REAL hand-knotted rugs. But their cheaper pricing masks their long-term costs. * They have much shorter useful lifespans (five years average) compared with REAL rugs (generations). * They're sometimes promoted as a "Green" product, but the landfills won't welcome all of the tufted rugs that will be clogging them in a short time. * They can damage some pre-finished floors. * They are difficult to clean, and when cleaned often no longer will lie flat on the floor. * Vacuuming soon gives them a fuzzy, "cheap garment" appearance. * They have an unpleasant odor (high rubber content). This is definitely a product where thinking it might be "good enough" really is not. 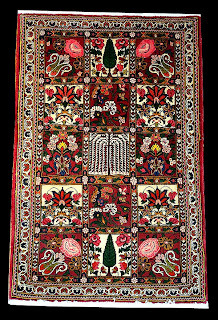 To learn more about "tufted rugs" -- now heavily promoted by many rug dealers and department stores in an attempt to chase scarce dollars with cheap goods-- please visit our website link : http://bit.ly/1sN5iC6. Also see our videos on "The Shocking Truth About Tufted Rugs" which can be viewed elsewhere on this blog at http://bit.ly/1VfK2Q5 .